Fitbit disappoints. Looking for alternative. I got really sick of changing the bands. Each band, even the original ones, lasted me an average of 3 months before cracking and splitting. 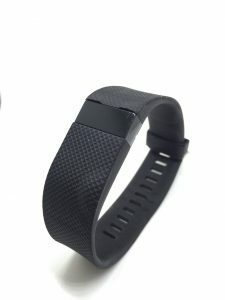 So fast forward to April 2016, I threw the still-functioning Fitbit Flex aside and got myself a Fitbit Charge HR (Gen 1). I love the heart rate detection feature as it allows me to track my heart rate when I have my rare jogs or when I feel unwell. In July 2016, barely 3 months after the purchase, my Fitbit Charge HR started peeling at the bangs and the band got bloated. A few days later, it became non-responsive and cannot be powered on again. Dead. There was much back and forth between Support and me and I got pretty frustrated because they were asking me one question per email and each email took several days to get a response from them. Finally, they agreed to ship a replacement to me – all the way from the U.S. Luckily, it didn’t take too long (a week+) for me to get the replacement. It took an entire month (till August) before I could close the matter with them. Fast forward to December 2016. Despite extra care taken by me (and almost zero instance of exercising with the band -_-), the bangs started peeling again and the bloating happened too. I discovered that the skin of the band was glued onto an inner band and adhesion doesn’t last more than a couple of months with daily removal of the band (it’s stupidly not waterproof enough to even wear into the shower). 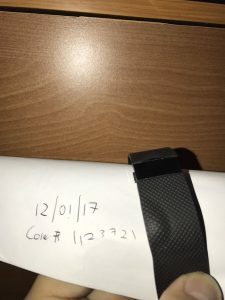 I raised a ticket with them in January 2017 and this time round, they wanted me to take a photo of the band with a piece of paper with handwritten date and a case number that they have just issued to me. As you can see from the image, the bloating is quite bad on this one. I requested for them to issue me a store credit so that I can order a different (more expensive) model that may not fail on me so often. No matter how I explained about the frustration that I had to go through due to the product flaw, they refused to obliged. They insisted to send me a replacement Fitibt Charge HR again. I’m obviously less than pleased. I am now looking around for a new fitness / wellness band. I do hope I can find a band that looks decent and can do more than just telling me about my heart rate. Maybe one day, I can measure my blood pressure without using my clunky Omron machine. Just maybe. Anyway, good bye Fitbit. Thanks but no thanks. Disclosure: Although I work in StarHub, I do not work in Marketing, Sales or the Prepaid product team. I have no personal vested interest in the prepaid product, I paid for the prepaid card with my own money and nobody in the company asked me to write this. I am writing this as an original content for my personal blog and also because out of my 5 trips to Taiwan, this is the first time I did not buy their local prepaid card. Since this is my 5th time in Taiwan, I’ve gotten pretty sick of queuing at the Taoyuan International Airport and having to present 2 photo IDs in order to sign up for a Taiwan prepaid card. It didn’t help that one traveller is only entitled to purchase 1 prepaid card. This had me scrambling to collect 2 photo IDs from each family member in order to get a prepaid card for each of them. Cost wise, a 10-day unlimited prepaid data plan from Chunghwa Telecom costs $500 NTD (~S$22.70). In the past, roaming data charges had been prohibitively expensive for casual travellers like me. Although I’m not in ops, I’ve been hearing about how affordable (planned) data roaming can be so I’ve convinced myself to give this a try. I have a choice between Data Travel and Happy Roam. 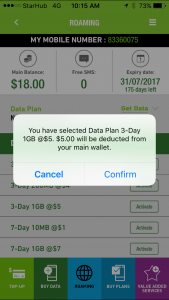 Without going into the specifics of both, I can highlight that Data Travel is more convenient as you can use your existing StarHub postpaid SIM to roam in a controlled manner. Downside is, the price is a tad more expensive at 2GB/30days/$15 (Data Quota / Validity / Price) compared to Happy Roam’s 1GB/3days/$5. The minor inconvenience for Happy Roam is that you need to get a StarHub Happy Prepaid card. For me, personally, I’ve already had the intention to plug a SIM into my Mobile Wi-Fi device anyway so an additional SIM means I don’t have to remove my current SIM from my iPhone. Since my prepaid card came with a promotional free 5-day 15GB local data, I did not have to worry about credits depleting due to background data usage just because I put it into a smart phone. If yours does not come with promotional free local data for the first X days, remember to turn off mobile data before inserting the prepaid SIM! You’ll be prompted to enter your Prepaid number and confirm the OTP that is sent to that number. I’ve noticed instances where OTP isn’t required such as when the prepaid SIM is inserted in the same phone that is running the app. Once authenticated, you can go ahead and purchase the plan. Purchase the plan 3 times if you need 3GB. For me, I had to purchase 5GB despite free Wi-Fi at most of my accommodation in Taiwan since I’m such a heavy social media user. Do remember to check your balance regularly so that you have ample time to top up and add on an extra GB or 2 if necessary. The following list of Pros and Cons are solely judged based on my trip to Taiwan. Skipped the queue at the airport. I was able to get online right after touch down before even arriving at the gate. Price comparable or even cheaper compared to a Taiwanese prepaid SIM if your data usage is 5GB or lesser. I had to monitor my data usage carefully on the StarHub prepaid SIM as it is not unlimited like the local Taiwan prepaid plans. There’s a hassle to switch out my original SIM with this new prepaid SIM unless I’m using an external Mi-Fi device. In the end, I used more data than I expected and had to top up another 2GB on top of my budgeted 3GB but that’s my problem. I would use Happy Roam again definitely if I’m heading to a country where I foresee myself not being able to (or want to) queue at the airport telco counter.